Saga Tofu Ine is a restaurant in Arashiyama offering yudofu and yuba (tofu skin). They have two restaurants in Arashiyama, one close to the Bamboo Grove, and another opposite of the main gate of Tenryu-ji Temple. Both restaurants offer you an opportunity to look at the beautiful scenery of Arashiyama from the second floor while you enjoy delicious yudofu and yuba with many other dishes. The prices are around 1,600 and 2,000 yen, so they are very reasonable for these kinds of tofu dishes. The staff are all used to visitors from overseas so this restaurant is easy to visit with your friends and family. I would like you to enjoy delicious and delicate yudofu and yuba at Saga Tofu Ine when you come to Arashiyama. *Notice that both of their restaurants don’t accept credit cards. This is their most popular menu item, a set with both yuba and yudofu. The yudofu has a nice texture and a great taste of soy beans to it, and after eating it you will feel surprisingly full. Many of the small dishes also contain tofu and soy bean milk in them so this set is very healthy. The tofu skin in a pail is such a great dish that I wish will have a chance to try it some time. You are supposed to dip the tofu skin into ponzu or noodle base soup. The tofu skin is lumpy and easy to eat. After you eat all of the tofu skin, you can put some ponzu or noodle base soup into the pail and enjoy the rest as a kind of soy milk soup. Kyoto-style tofu skin set with tofu skin on top of rice topped with a thick dashi-soup is also a popular menu item. Besides the big skin pieces on top of the rice, you also have tempura you can dip in matcha salt, and wheat gluten with sweet miso paste. By the restaurant you have a stall where they sell donuts and soft cream made with yuba for takeout. These make for great desserts, the donuts with the subtle sweetness of tofu, and the soft serve you can have half-and-half with matcha. Their menu is in English and Chinese. They also have English speaking staff. Note that credit cards are not accepted. Everyone needs to order something, but you can only order a drink. I want to heartily recommend this restaurant to those who want to enjoy yudofu and yuba. Their north branch is in a traditional Japanese building that used to be a ryokan so it’s really spacious and clean. The great second floor seats from where you can see the incredible Arashiyama scenery are especially popular during the autumn leaves period. Since the restaurant is so close to famous sightseeing spots it should be easy to fit into your itinerary. 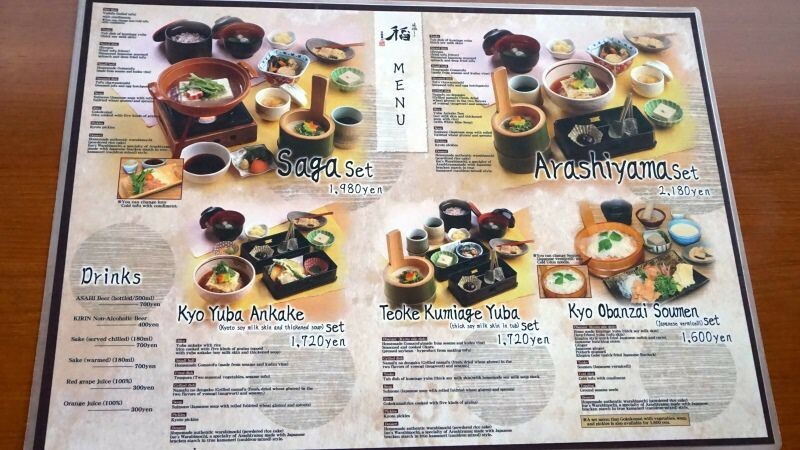 This restaurant offers such Kyoto classics as yuba and yudofu at very reasonable prices. The restaurant is spacious, and the seating area is spacious too so it’s also great for families with small children. During lunch time there is often a line in front of the restaurant, but many restaurants in Arashiyama have lines in front of them during lunch time, so I would like to recommend you still go to Saga Tofu Ine. A 1-minute walk away from Randen (Keifuku) Arashiyama Station, or a 15-minute walk away from Hankyu Arashiyama Station. They have English speaking staff so it’s easy to order food here. Just notice that you cannot use credit cards.